This is the final day of the 30 paintings 30 days challenge from artist/blogger Leslie Saeta. Although I didn’t get all thirty paintings posted, the challenge has jump started my year and I am happy for that little push. I have posted more on my blog than usual finding that I could actually write faster and show a work in progress or final piece. I tend to wait til it is totally finished before letting it out in the world. But there is something to be said for letting people see the “struggle” of a piece too. This piece was conceived while sitting in an airport waiting for a flight back to cold NH. I thought how lovely the warm air had been in Florida visiting my gallery Galerie du Soleil in Naples. So this snowbird idea came to me–how could I show both FL and NH landscapes in one painting. And here is my first effort at doing just that. Let me now your thoughts! 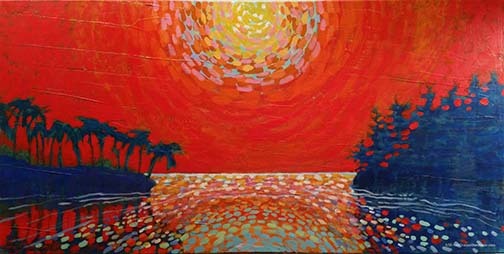 24×48, acrylic on canvas, One Sun, Two Loves.